Ocean Breeze West, the affordable condo directly on the gulf, is perfect for those who enjoy small complexes. The building has 47 units with a Gulf front swimming pool and a large sun deck. This ground floor condo has 980 SF of living area and Gulf Front balcony access from the Living Room and Master Bedroom. Beautiful decor with Ceramic Tile throughout. Electronics include 32" LCD TV, DVD in Living Room and 14" TV in Master Bedroom. 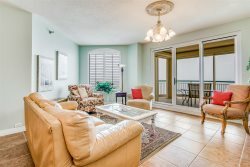 A NOTE FROM THE OWNER: As you enter the condo, the open floor plan offers a gorgeous view of the beach through the sliding glass doors. The large spacious patio area provides an additional seating area to enjoy the ocean breezes. Having owned condos in the area since 1998, we always enjoy the quiet atmosphere of this part of the beach. From the close proximity of the parking area to the easy beach access from our ground floor unit. Ocean Breeze West 104 is ideal for that special getaway. We love Ocean Breeze West 104! It is beautiful.